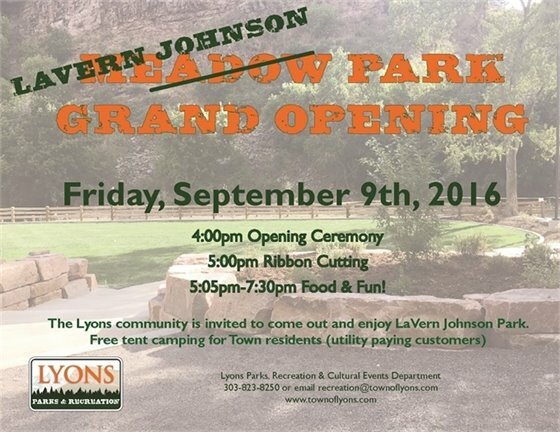 The Lyons community is invited to a special grand opening of LaVern M. Johnson Park, to celebrate the first restored park since the 2013 flood. The event will take place at the park on Friday, September 9, beginning at 4:00 p.m. Key representatives will speak from 4:00 p.m. to 5:00 p.m., followed by a ribbon cutting. Light refreshments will be provided. We hope you will join us for this exciting and meaningful event. Newly-promoted Commander Nick Goldberger served as Boulder County Sheriff's Office Sergeant to Lyons for three and a half years. With his new promotion, he'll be serving a new area, outside of Lyons. While Commander Goldberger will be missed, the Town is excited to welcome Bill Crist as the new Sergeant assigned to Lyons! Hello, I wanted to take a moment to thank you for allowing me to serve you since February 2013, it has been an honor. As some of you are aware, I was promoted to Commander of Operations in August and as such my new digs are at headquarters in Boulder and not in the fantastic Town of Lyons. I have learned much from my short 3 ½ years serving you all and I cherish the years that I have been in Lyons. I will certainly be around and will certainly frequent the fine shops and surrounding area. Sgt. Bill Crist has taken my position and will make an excellent addition to the Town of Lyons extended family. He is a fantastic husband and father. Bill is also a great Sgt. for the Sheriff’s Office. Thanks again for all the memories!! Lyons thanks you for your service, Commander Goldberger! Good morning Town of Lyons!! Allow me to introduce myself. For those that don’t know me already, my name is Bill Crist and I’m your new Police Chief. I took over the position as of August 26th for the out bound Sergeant Nick Goldberger who was promoted to Commander. I have some pretty big shoes to fill and will give it my all to satisfy the needs of our community and carry on the excellent work that has been done by my predecessors. I and all the Deputies that work here follow this statement and strive to do the very best they can for the town and the surrounding areas that we serve. Open communication is a big part of the community policing philosophy; we must all work together to build and nurture a strong relationship. My commitment to the town of Lyons, all the residences, and those that pass through is this: I (and my team) will uphold the laws, rules, regulations and codes of the state of Colorado, county of Boulder and the Town of Lyons. We will work hard to serve the needs of the community and impart a safe and peaceful environment for all to enjoy. I’m very excited to start this new chapter in my career, I can’t think of a better assignment than this. Thank you all for allowing me to serve you. I will be making some rounds through town over the next few weeks so I can meet and greet you all. Our door is always open so feel free to stop by and say hi. Lyons Made it to the Final Round! The Lyons Community is a force to be reckoned with! Thanks to the community’s incredible support, Lyons has made it to the FINAL!! round of Elevation Outdoors Magazine’s Top Adventure Town poll! 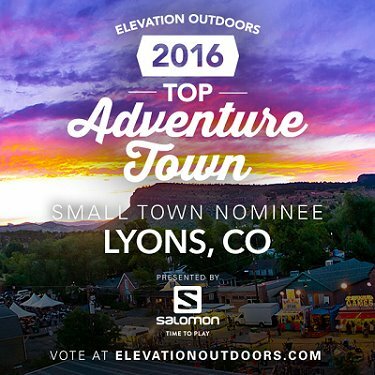 This would be an awesome opportunity to showcase Lyons as a destination - let's show 'em how cool our town really is! This is a long round, ending at 9a on Monday, September 19. Each person can vote once every 24 hours, so vote early and often! Final stretch, let's win this thing! The initial machine pouring of curb and gutter, along the north and south sides of both Prospect St. and Park St., and the west side of 4th Ave. between Prospect St. and Park St. is complete. Beginning the week of September 12, the second stage of curb and gutter - hand pouring - will begin along these roads. Following the concrete hand pouring, cured curb and gutter will be backfilled in segments. South side of Evans St.
Machine pouring on north side of Evans St.
During this phase, street and front driveway access will be closed to all traffic, including residents, on weekdays from 7 a.m. to 5 p.m. Project leads estimate the closures to last +/- two weeks per frontage. If you reside within this area, please utilize adjacent alley space as much as possible. If you are unable to access alley space, please contact Project Manager, Joe Kubala by email or at 303-823-6622, ext. 42, to develop a temporary parking plan. Thank you for your continued patience. The end is in sight! Over the past week, the median left turn lanes have been reestablished throughout the project. The contractors are preparing installation of raised medians at crosswalk locations along US-36, anticipated to be poured the week of September 12. Landscaping along the north side of US-36 is underway. Lane closures and other traffic delays can be expected throughout the project, during weekdays, from 7 a.m. to 7 p.m. Please note the speed limit remains at 25/35 mph in the construction zone. Your cautious driving may save a life. Continuing on Thursday, the Town of Lyons, along with the hired consultant team, will move forward with its final series of public meetings for the Lyons Primary Planning Area (LPPA) Master Plan. The workshop on September 8 will be the final workshop in this series. The Town of Lyons is pleased to welcome Dr. Alexis Saccoman to educate parents and teens on addiction, recovery, and the scientific effects of substance abuse to the teenage brain. No matter what you think you know on this topic, you might be surprised about what you don’t know. This event is informative and entertaining for all! 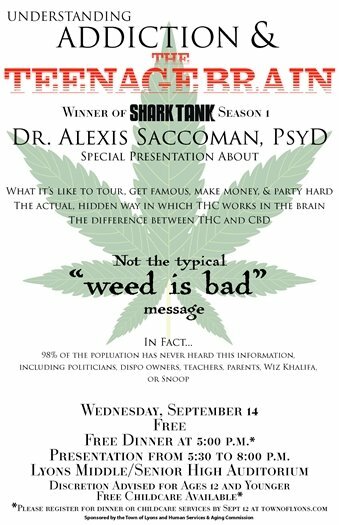 Dr. Alexis is a dynamic and comedic presenter who also brings a teenager with first-hand experience to speak about the struggles associated with addiction. Toward the end of this presentation, there will be a panel which consists of people who specialize on the issue of adolescent substance use. (Outpatient, inpatient, partial hospitalization, wilderness therapy, eco-psychology, sober communities etc.) By attending this event you will receive a free light dinner prior to the presentation and American Red Cross certified childcare for children younger than 6th grade. Registration is required. To register call 303-823-8250 or e-mail recreation@townoflyons.com. Capture the flag with foam swords! (actually, it's so much more!) Skirmishers are divided into small teams to overcome a series of challenges that require teamwork, planning, fast thinking, and plenty of dueling using safe foam Swasher sword sports equipment. This is a high-energy, incredibly fun, FREE event for kids age 6-12, offered by Renaissance Adventures. Since 1995, Renaissance Adventures has led award-winning summer camps, birthday parties, after-school programs, and events for children and teens, with the mission to develop 21st century skills through live-action role-playing games. Learn more at www.RenaissanceAdventures.com. Sunday, September 11 | 1 p.m. to 3 p.m.
Lyons Redstone Museum | 343 High St.
More than a dozen Cameras from 1890s to 1990s will be on exhibit at the Lyons Redstone Museum . On opening day, three local professional photographers will be describing the unique features of each camera. Included will be an informative handout, examples of the photo process ("why is the picture upside down? "), and samples of photography paraphernalia to hold and investigate. Cameras go from a subminiature 2"x2" camera to a wood and brass camera with a 4x5" glass plate, and a $4 Brownie camera used by an early settler of Lyons. SVCC is pleased to announce that they have hired a team of consultants for their Creek Rehabilitation Plan for Apple Valley project, funded by the Colorado Department of Local Affairs CDBG-DR Resilience Planning program. Ecology Board Hosts Movie: "Fresh"
The Town of Lyons Ecology Advisory Board will host a movie Friday, Sept. 9 at 7 p.m., at Stonebridge Farm, 5169 Ute Highway, east of the US-66/ US-36 intersection. The movie, "Fresh" explores agricultural issues including loss of biodiversity, soil depletion, and displacement from farming communities. “Fresh” offers new solutions through organic farming that respect land, soil, farmers, wildlife and consumers alike.